...Mr. Wiley's work is unlike any other in recent art, a visual analog to the stream-of-consciousness strain in 20th-century literature. Likening Mr. Wiley to Virginia Woolf or James Joyce is dicey, of course, but his swirling cornucopias of images, words and associations are every bit as intoxicating, operating beyond their medium, in the subconscious. 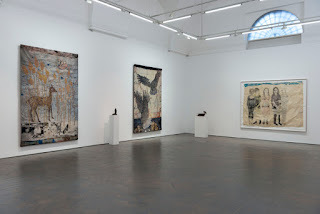 He is less a contemporary artist than a national treasure. "What's It All Mean" travels next to the Berkeley Art Museum, where it will open in the spring of 2010; the show includes Kali-fornia Dreamin, Wiley's 2006/2007 edition of etching and watercolor buttons inside a handmade leatherbound box, published by Magnolia Editions. 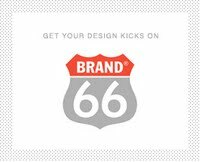 Brand66 is a blog from design guru Michael Rylander, whose company Rylander Design has an impressive roster of clients including Apple, BMW, PBS, and NeXT, to name only a few. We were thrilled to discover that a fellow with such obvious visual acumen and taste is a fan of Magnolia Editions tapestries! Check out his recent post about Don Farnsworth and the Magnolia tapestry method. 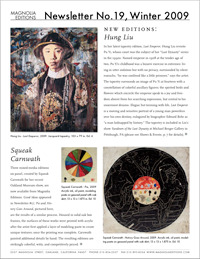 Featuring new editions from Hung Liu, Squeak Carnwath, Deborah Oropallo, Enrique Chagoya, Alan Magee, William T. Wiley, Richard Wagener, and more.